My friend Greg and I just finished the DTQWT mk III please look at the attached photos. A bit of history on how I ended up making the DQWTMKIII speakers. 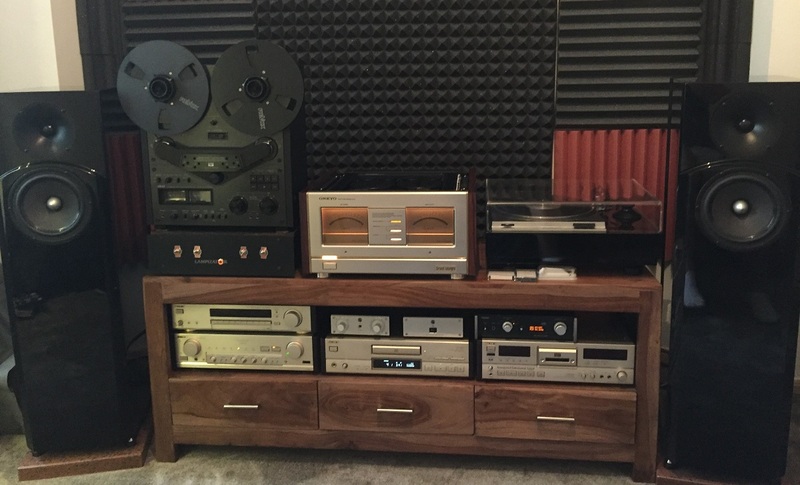 When i first listened to Greg's speakers( he made his in 2006) at his home I was surprised that a DIY made speakers could sound so HI-end minding the fact that they were powered by a hi-end amp (Sony TANR10) music source was a CD deck also SONY CDPX779ES this set up plus your DTQWTmmkII sound so well that i started to save money to do the same project. By the time I got enough money saved Greg found that you have updated the DTQWT to mkIII. So we started the dtqwt mk III project overall about the same cost of Drivers and material. it took us almost full year to make them ,we did this in our spare time whenever we got away from "normal life responsibilities. work, kids, wife etc. We made our own "upgrades on the cabinets as you can see on the photos. basically the size is the same inside but on the outside we used 4cm plywood birch to compensate the big bass 12inch speaker on the back. Sorry Troels but your design seemed ugly to us especially the back side with the extra wood on the back extending to the sides so we added a2cm to both sides We came to a conclusion that with "our extra 2cm on both of the sides made the construction look "Normal" and no problem with the bass speaker,and finishing it with piano black lacquer. I must underline that we kept the inside measurements exactly as in your cabinets drawing. JUST the outside "got bigger by 2cm. this of course it made the speakers heavy (exactly with the drivers they are 45Kg). To us it came out excellent.Dduring the preparation work I took your advice before mounting the 12inch bass driver I would take it out from the box and push it back and forward while listening to music or watching a movie on the TV so to make "burn in" so it will not be so stiff once in the cabinet. I think overall that was a good idea and it worked. rest you can see on the photos. the tools we used were a router an electric sanding, wood glue (the white stuff) damping material according to your specifications. The drivers used were as well as you designed with the exception that the tweeters are AUDAX TW034. because I got them for the first DTQWTmkII projects and since you claim there is not much of a difference in sound I used the Audax tweeter.. OVERALL we were astonished by the sound the speakers produce!!!! the BASS is so solid that my neighbor thought I was knocking down a wall when I played some Rock music with a drum solo. The treble are as you wrote clear and so realistic with pinpoint accuracy who and where is one performer playing. On the photos you can see what gives the power to your great hi-end sounding speakers. Its the ONKYO M510 power house drived by the Sony pre-amp TA e80ES modified by Greg (ultra quite psu and clean sound by upgrading componets to hi end specs). source of music cd player CDPX779ES and DAT player DTC2000ES and the best to my ears i sthe SONY turntable SME tone arm with GRADO SS one MC cart. playing vinly LP's all sort of music from jazz (john Coltrain, Miles Davis) to Rock ( Led Zepllin, Wishbone Ash,) and many others . the speakers are awesome and astonish anyone that visits me and listens to music Some of my friends are perplexed how did we managed to make such a hi-end sounding speaker of course all the credits go to You Troels we just did the hard part ofputting it together with sweat,blood and tears along the way but it was worth every minute and penny put to this project so big thanks for sharing your work. If you would ever come to POLAND feel invited and come by to join us for a music session bring your LP's or CD's and enjoy the music.